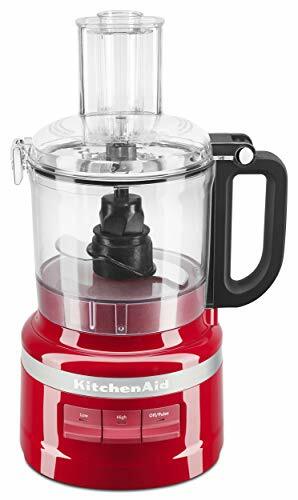 KitchenAid KFP0718ER Food Processor, 7-Cup, Empire Red is currently selling at $74.00, approximately $6.13 lower than average, giving a potential saving of $25.00 right now. With a lowest price of $74.00 and an average of $80.13 it is selling on the low end of its usual range. Price volatility is 1.34% (meaning it does not change often), so the price should stay low for a while. Right now this product is a recommended 'fantastic deal'. The current deal is also the best price on this item over the last month. Compare the current price, savings (in dollars & percent) and Buy Ratings for the top Food Processors that are closely related to KitchenAid KFP0718ER Food Processor, 7-Cup, Empire Red. Here is how KitchenAid KFP0718ER Food Processor, 7-Cup, Empire Red compares with other leading Food Processors. Easy to Use, Clean and Store. This 7-Cup Food Processor features an innovative design with a one-click, twist-free, bowl assembly and latched lid that is very easy to use and clean. The blade and disc fit inside the bowl to make storage easy. Simple Controls with 3 Speed Options (High, Low and Pulse) handle a variety of ingredients with precision, and the easy-press paddles and illuminated LED controls make operation simple. Chop, Puree, Shred and Slice everything from cucumbers to tomatoes, cheeses and more with the reversible medium slicing/shredding disc and multi-purpose blade. A variety of shapes and sizes can be processed in the 2-in-1 feed tube located on the lid. 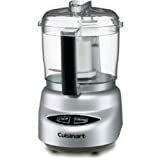 The small pusher features a small oil drizzle opening for emulsifying sauces and dressings. FeaturesOne-click, twist-free bowl assembly with a latched lid for easy set up.Easy to Clean with the sealed, leak-resistant work bowl, which means less food gets trapped in the bowl and lid. Also, the bowl, lid and accessories are all dishwasher-safe.Easy to store with a compact design, in-bowl accessory storage and convenient cord wrap.High, Low and Pulse Speeds to handle a variety of ingredients with precision. The easy-press paddles and illuminated LED controls make operation simple.